← Can NYC Beaches get Swallowed by the Sea in a Storm? New York City, like most megacities including Tokyo, does not have mechanisms in place to evacuate the population of the entire city. Even the direst catastrophic scenarios entail a strategy of sheltering in place for at least some of the affected population. It’s simply too challenging to evacuate 13 million people, in the case of Tokyo. And given the compounding devastation and dislocation wrought by the tsunami and earthquake, further evacuations are even more problematic. That is why the intermittent low-level radiation releases over the coming weeks and months envisioned even in the best case is so troubling to a densely inhabited island. A few years ago we published a paper showing high-resolution (~1 km) simulations of tracer releases in various coastal areas of Japan. 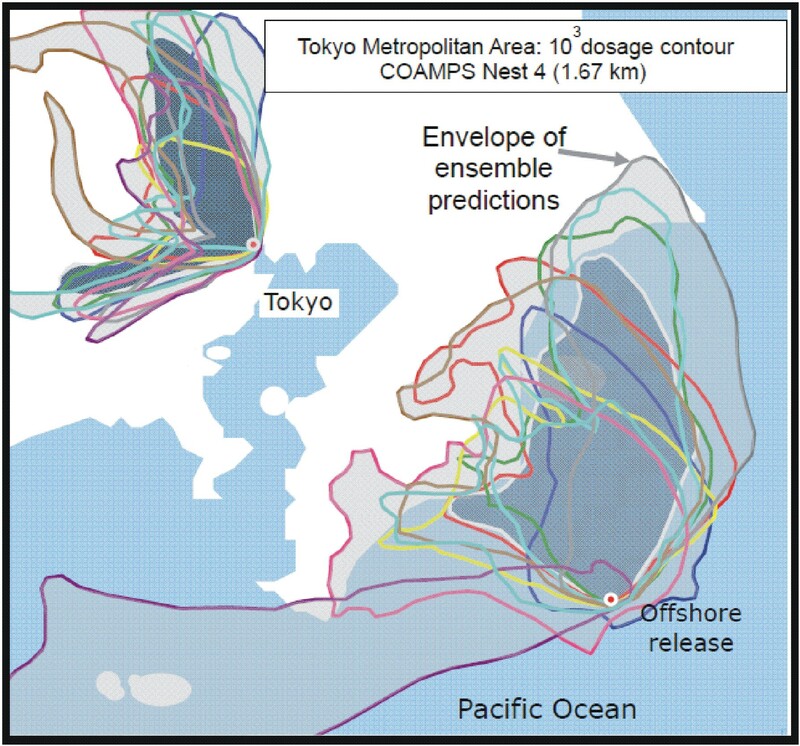 ** We demonstrated an “ensemble” framework that allowed a more accurate estimation of plume shapes and exposed population. Our technique involved varying key ocean and atmosphere parameters used by a meteorological model (e.g., sea surface temperatures, urban sources of heat, building heights) to better capture the variability and produce more realistic wind forecasts. Our results showed that coastal releases are subject to fluctuating conditions so that even though the average direction of winds is off-shore at most locations along the east coast of Japan, events like weather fronts and sea breezes can still drive the plumes toward large inland cities. Model simulated accumulated 12-hour dosage for two arbitrary tracer releases in Tokyo and offshore of Tokyo. The different shaded contours represent different realizations in the model ensemble. The bi-pronged distribution for Tokyo is due to the timing of the release relative to the sea breeze. (Westward is before sea breeze; northward is after sea breeze). After experiencing airborne radiation at their location 60 miles offshore of the reactors, U.S. Navy ships providing assistance to the Japanese relocated today. This is indicative of widespread low-level radiation release. The impact on sites inland remains worrying given the coastal variability that we documented in our research. And indeed, high-resolution model forecasts that I have seen for Japan for the next few days predict a pattern of onshore and southwestward winds of 5-10 knots in the vicinity of the reactors. New York City has an average wind direction blowing toward the east, but plume transport on any given day could be in any other direction. This variability can result from weather fronts, northward sea breezes, and the reverse, weaker southward land breezes. The Indian Point nuclear power plant is located 35 miles north of midtown Manhattan. Although vulnerabilities to earthquakes are minimal, terrorist activity against the three-unit site remains a concern. Evidence suggests Al Qaeda had originally targeted Indian Point for 9/11 attacks. **Teddy Holt, Julie Pullen, and Craig Bishop, “Urban and ocean ensembles for improved meteorological and dispersion modeling of the coastal zone,” Tellus, 61A, 232-249, 2009. This entry was posted in air pollution, security, weather and tagged Indian Point, Japan, Manhattan, meteorology, New York City, nuclear, radiation, sea breeze, Tokyo, wind. Bookmark the permalink.